2. Martin N Rossor, Nick C Fox, Catherine J Mummery, Jonathan M Schott, Jason D Warren The diagnosis of young-onset dementia. Lancet Neurol. Author manuscript; available in PMC 2010 September 30. 6. Farrell MT1, Zahodne LB, Stern Y, Dorrejo J, Yeung P, Cosentino S. Subjective word-finding difficulty reduces engagement in social leisure activities in Alzheimer's disease. J Am Geriatr Soc. 2014 Jun;62(6):1056-63. doi: 10.1111/jgs.12850. Epub 2014 Jun 2. 7.Mangialasche F1, Kivipelto M, Solomon A, Fratiglioni L. Dementia prevention: current epidemiological evidence and future perspective. Alzheimers Res Ther. 2012 Feb 13;4(1):6. doi: 10.1186/alzrt104. 8. Lykouras L1, Gournellis R. Behavioral and psychological symptoms of dementia and their management.Psychiatriki. 2011 Jan-Mar;22(1):24-33. 9. Koppel J1, Greenwald BS2. Optimal treatment of Alzheimer's disease psychosis: challenges and solutions. Neuropsychiatr Dis Treat. 2014 Nov 24;10:2253-62. doi: 10.2147/NDT.S60837. eCollection 2014. 11. Duyckaerts C, Delatour B, Potier MC. Classification and basic pathology of Alzheimer disease. . ActaNeuropathol. 2009 Jul;118(1):5-36. Epub 2009 Apr 21. 15. Sastre M1, Richardson JC, Gentleman SM, Brooks DJ. Inflammatory risk factors and pathologies associated with Alzheimer's disease. Curr Alzheimer Res. 2011 Mar;8(2):132-41. 16. Peskind ER1, Li G2, Shofer JB3, Millard SP3, Leverenz JB4, Yu CE5, Raskind MA1, Quinn JF6, Galasko DR7, Montine TJ8. Influence of lifestyle modifications on age-related free radical injury to brain. JAMA Neurol. 2014 Sep;71(9):1150-4. doi: 10.1001/jamaneurol.2014.1428. 17. Okonkwo OC1, Schultz SA2, Oh JM2, Larson J2, Edwards D2, Cook D2, Koscik R2, Gallagher CL2, Dowling NM2, Carlsson CM2, Bendlin BB2, LaRue A2, Rowley HA2, Christian BT2, Asthana S2, Hermann BP2, Johnson SC2, Sager MA2. Physical activity attenuates age-related biomarker alterations in preclinical AD. Neurology. 2014 Nov 4;83(19):1753-60. doi: 10.1212/WNL.0000000000000964. Epub 2014 Oct 8. 18. Zhou S, Zhou R, Zhong T, Li R, Tan J, Zhou H1. Association of smoking and alcohol drinking with dementia risk among elderly men in china. Curr Alzheimer Res. 2014;11(9):899-907. 19. Thorin E1.Hypertension and Alzheimer disease: another brick in the wall of awareness. Hypertension. 2015 Jan;65(1):36-8. doi: 10.1161/HYPERTENSIONAHA.114.04257. Epub 2014 Oct 20. 20. Wood WG1, Li L, Müller WE, Eckert GP. Cholesterol as a causative factor in Alzheimer's disease: a debatable hypothesis. J Neurochem. 2014 May;129(4):559-72. doi: 10.1111/jnc.12637. Epub 2014 Jan 2. 21. Li JG1, Chu J, Barrero C, Merali S, Praticò D. Homocysteine exacerbates β-amyloid pathology, tau pathology, and cognitive deficit in a mouse model of Alzheimer disease with plaques and tangles. Ann Neurol. 2014 Jun;75(6):851-63. doi: 10.1002/ana.24145. Epub 2014 May 28. 22. Hu N1, Yu JT, Tan L, Wang YL, Sun L, Tan L. Nutrition and the risk of Alzheimer's disease. Biomed Res Int. 2013;2013:524820. doi: 10.1155/2013/524820. Epub 2013 Jun 20. 24. Dufouil C1, Seshadri S2, Chêne G1. Cardiovascular risk profile in women and dementia. J Alzheimers Dis. 2014 Jan 1;42(0):S353-63. doi: 10.3233/JAD-141629. 25. Nguyen JC1, Killcross AS2, Jenkins TA1. Obesity and cognitive decline: role of inflammation and vascular changes. Front Neurosci. 2014 Nov 19;8:375. doi: 10.3389/fnins.2014.00375. eCollection 2014. 26. Richardson JR1, Roy A2, Shalat SL1, von Stein RT2, Hossain MM1, Buckley B2, Gearing M3, Levey AI4, German DC5. Elevated serum pesticide levels and risk for Alzheimer disease. JAMA Neurol. 2014 Mar;71(3):284-90. doi: 10.1001/jamaneurol.2013.6030. 27. Okun MS1, DeLong MR, Hanfelt J, Gearing M, Levey A. Plasma testosterone levels in Alzheimer and Parkinson diseases. Neurology. 2004 Feb 10;62(3):411-3. 28. Richardson JR. Testosterone as the missing link between pesticides, Alzheimer disease, and Parkinson disease--reply. JAMA Neurol. 2014 Sep;71(9):1190. doi: 10.1001/jamaneurol.2014.1814. 30. Henderson VW1 Three midlife strategies to prevent cognitive impairment due to Alzheimer's disease. Climacteric. 2014 Dec;17 Suppl 2:38-46. doi: 10.3109/13697137.2014.929650. Epub 2014 Aug 17. 32. Gabryelewicz T. Pharmacological treatment of behavioral symptoms in dementia patients. Przegl Lek. 2014;71(4):215-20. 33. Broadstock M1, Ballard C, Corbett A. Latest treatment options for Alzheimer's disease, Parkinson's disease dementia and dementia with Lewy bodies. Εxpert Opin Pharmacother. 2014 Sep;15(13):1797-810. doi: 10.1517/14656566.2014.936848. Epub 2014 Jul 3. 34. Wu S1, Ding Y2, Wu F3, Li R1, Hou J4, Mao P5. Omega-3 fatty acids intake and risks of dementia and Alzheimer's disease: A meta-analysis. Neurosci Biobehav Rev. 2015 Jan;48C:1-9. doi: 10.1016/j.neubiorev.2014.11.008. Epub 2014 Nov 21. 35. Schlögl M1, Holick MF2. Vitamin D and neurocognitive function. ClinIntervAging. 2014 Apr 2;9:559-68. doi: 10.2147/CIA.S51785. eCollection 2014. 36. Littlejohns TJ1, Henley WE1, Lang IA1, Annweiler C1, Beauchet O1, Chaves PH1, Fried L1, Kestenbaum BR1, Kuller LH1, Langa KM1, Lopez OL1, Kos K1, Soni M1, Llewellyn DJ2. Vitamin D and the risk of dementia and Alzheimer disease. Neurology. 2014 Sep 2;83(10):920-8. doi: 10.1212/WNL.0000000000000755. Epub 2014 Aug 6. 37. AnnweilerC1, DursunE, FéronF, Gezen-AkD, KalueffAV, LittlejohnsT, LlewellynDJ, MilletP, ScottT, TuckerKL, YilmazerS, BeauchetO. 'Vitamin D and cognition in older adults': updated international recommendations. J Intern Med. 2015 Jan;277(1):45-57. doi: 10.1111/joim.12279. Epub 2014 Jul 19. 38. Chaves M1, Toral A, Bisonni A, Rojas JI, Fernández C, Basallo MJ, Matusevich D, Cristiano E, Golimstok A. Treatment with vitamin D and slowing of progression to severe stage of Alzheimer's disease.Vertex. 2014 Mar-Apr;25(114):85-91. 39. Annweiler C, Beauchet O. Possibility of a New Anti-Alzheimer's Disease Pharmaceutical Composition Combining Memantine and Vitamin D. Drugs Aging. 2012 Feb 1;29(2):81-91. 40. Chaves M1, Toral A, Bisonni A, Rojas JI, Fernández C, Basallo MJ, Matusevich D, Cristiano E, Golimstok A. [Treatment with vitamin D and slowing of progression to severe stage of Alzheimer's disease]. Vertex. 2014 Mar-Apr;25(114):85-91. 42. Yang M1, Xu DD, Zhang Y, Liu X, Hoeven R, Cho WC. A systematic review on natural medicines for the prevention and treatment of Alzheimer's disease with meta-analyses of intervention effect of ginkgo. Am J Chin Med. 2014;42(3):505-21. doi: 10.1142/S0192415X14500335. 43. Tyszka-Czochara M, Grzywacz A, Gdula-Argasińska J, Librowski T, Wiliński B, Opoka W. The role of zinc in the pathogenesis and treatment of central nervous system (CNS) diseases. Implications of zinc homeostasis for proper CNS function. Acta Pol Pharm. 2014 May-Jun;71(3):369-77. 45. Hamaguchi T1, Ono K, Yamada M. REVIEW: Curcumin and Alzheimer's disease. CNS Neurosci Ther. 2010 Oct;16(5):285-97. doi: 10.1111/j.1755-5949.2010.00147.x. 48. Ono K1, Hasegawa K, Naiki H, Yamada M. Curcumin has potent anti-amyloidogenic effects for Alzheimer's beta-amyloid fibrils in vitro. J Neurosci Res. 2004 Mar 15;75(6):742-50. 49. DiSilvestro RA1, Joseph E, Zhao S, Bomser J. Diverse effects of a low dose supplement of lipidated curcumin in healthy middle aged people. Nutr J. 2012 Sep 26;11:79. doi: 10.1186/1475-2891-11-79. 50. Progression of Brain Ageing, Criteria for Preclinical Alzheimer’s Disease, International Conference on Alzheimer’s Disease, September 25, 2010. 51. Shoba G1, Joy D, Joseph T, Majeed M, Rajendran R, Srinivas PS. Influence of piperine on the pharmacokinetics of curcumin in animals and human volunteers. Planta Med. 1998 May;64(4):353-6. 52. Antony B1, Merina B, Iyer VS, Judy N, Lennertz K, Joyal S. A Pilot Cross-Over Study to Evaluate Human Oral Bioavailability of BCM-95CG (Biocurcumax), A Novel Bioenhanced Preparation of Curcumin. IndianJPharmSci. 2008 Jul-Aug;70(4):445-9. doi: 10.4103/0250-474X.44591. 53. SasakiH1, SunagawaY, TakahashiK, ImaizumiA, FukudaH, HashimotoT, WadaH, KatanasakaY, KakeyaH, FujitaM, HasegawaK, MorimotoT. 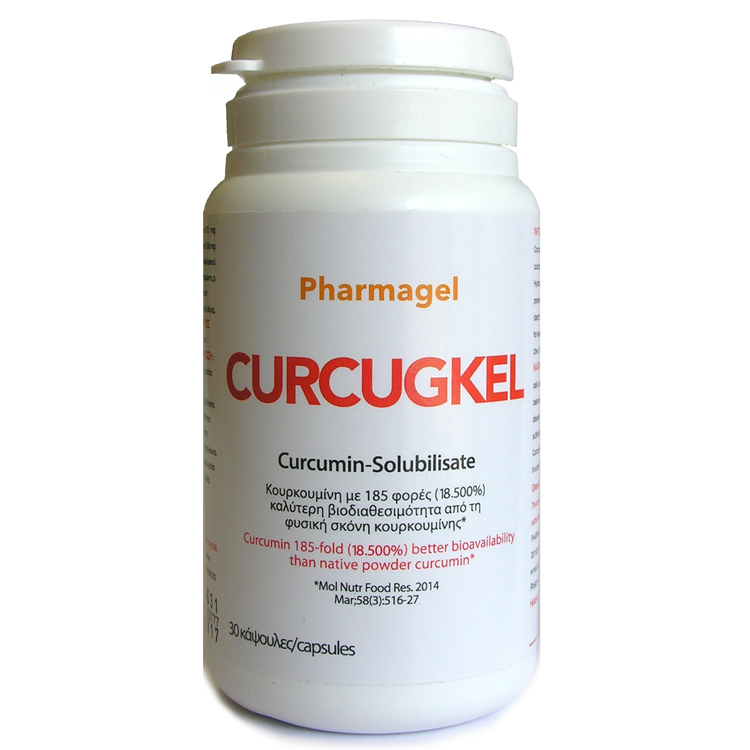 Innovative preparation of curcumin for improved oral bioavailability. Biol Pharm Bull. 2011;34(5):660-5. 54. DiSilvestro RA1, Joseph E, Zhao S, Bomser J. Diverse effects of a low dose supplement of lipidated curcumin in healthy middle aged people. Nutr J. 2012 Sep 26;11:79. doi: 10.1186/1475-2891-11-79. 57. Cuomo J1, Appendino G, Dern AS, Schneider E, McKinnon TP, Brown MJ, Togni S, Dixon BM. Comparative absorption of a standardized curcuminoid mixture and its lecithin formulation. JNatProd. 2011 Apr 5;74(4):664-9. doi: 10.1021/np1007262.Epub2011Mar 17. 58. Schiborr C, Kocher, A, Behnam D, Jandasek J, Toelstede S, Frank J. The oral bioavailability of curcumin from micronized powder and liquid micelles is significantly increased in healthy humans and differs between sexes. Mol. Nutr. Food Res. 2014, 0, 1–12.